When my grandchildren were little, we vacationed one summer at the beach. During that week I rediscovered the simple joy of building sandcastles. Every day, armed with plastic buckets and shovels, we marched across the dunes and over the sand to the place where the ocean lapped against the shore. There, just beyond the waves, we amused ourselves for hours filling and dumping buckets of sand until our sandcastle was complete. However, no matter how big our castle was when we left, the next day when we returned, it was gone. We expected this. 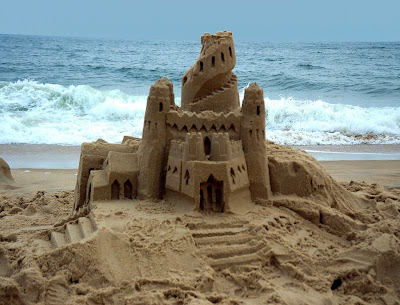 Sand is not a permanent building material. On the other hand, the beachfront condo where we stayed was built with steel and concrete. That material proved its worth one fall when a hurricane hit. Although 100 mile-an-hour winds shook the condo, and tide surges flooded the first floor, the building stood firm. When the hurricane was over, the structure was still there. It had made it through the storm. Storms are a part of life, and they come in many forms. Sooner or later each of us will face difficult circumstances that threaten and shake our world. When that happens, Jesus told us how to stand firm. He said, 'Therefore everyone who hears these words of mine and puts them into practice is like a wise man who built his house on the rock ' (Matthew 7:24). In other words, Jesus advised us to build our lives on His Truth. When our lives are based on hearing and applying God’s Word, adversity won’t wash us away. We won’t collapse because our foundation is indestructible. Father, we are reassured by Your Word and Your faithfulness.